Deceased in 1999, for many years our sales list described Portia as epitomizing the Roeburn “standard of excellence”. She was a strikingly stylish, feminine, long-bodied doe with a wide and smoothly blended front end, and a broad and very level rump. Her udder, once described as “close to ideal” by David Funk, was very high and wide in the rear, with excellent fore extension, and lost nothing over the course of her many lactations. 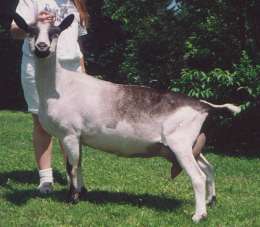 Completing her championship as a 3 year old, Portia continued to excel in the show ring for several more years, and was last shown at age eight. Her show record included 4 GCH, 6 BOB, 2 BIS, and 1 BUIS wins. Portia’s son, Falstaff, by GCH Munchin Hill Napoleon, sired two first place winners, and the Junior Champion, Kickapoo Valley False Jealousy, at the 1996 National show! Falstaff daughters in the Kickapoo Valley herd placed 5th and 7th yearling milkers in the 1997 National, and his daughter Kickapoo Valley False Madaam was first place milking yearling at the 2000 National and 2nd place two year old at the 2001 National! In 1998 Falstaff sired the 1st place senior kid at the National show. His two year old daughter, Jasmine, appraised FS 90. Our very first “homebred” GCH and a much loved member of the family, Portia has also had a very significant impact on the development of the Roeburn herd. Bathsheba wins Best in Show! Roeburn’s KVLS Mila is a GCH!!! © 2019 Roeburn French Alpines.